While having a world of fun at “the bluegrass” (Walnut Valley Festival), we were talking with some friends about our plans for returning home and they asked if I had burger-stop planned before flying from Wichita. I told them we had tried Jack’s North High, Nuway and Bionic Burger on a previous trip. Altitude Boy said, “Have you ever been to Freddy’s? 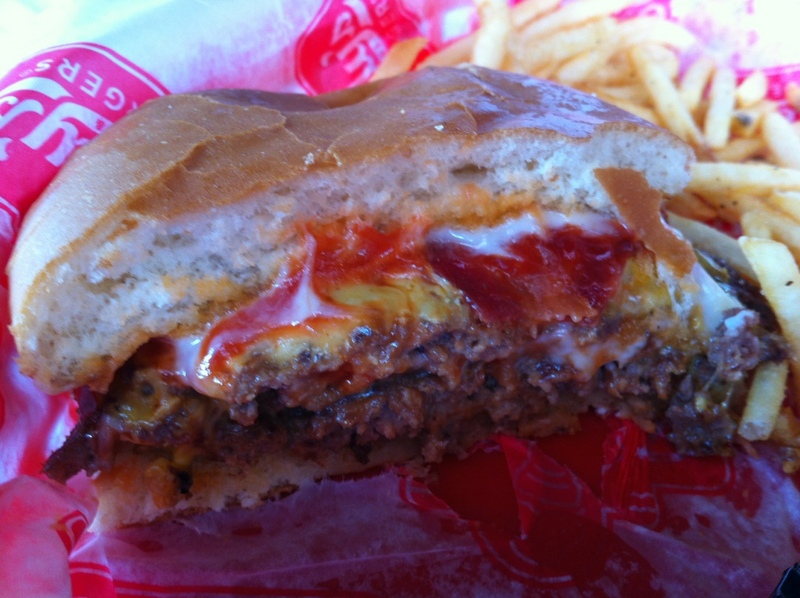 It’s not fast food, but it is a good burger.” At that point, the decision was made. 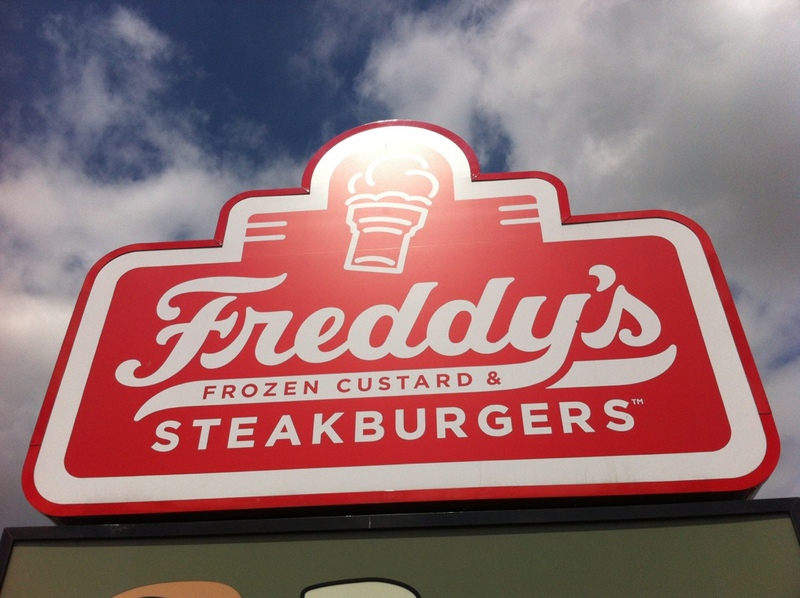 As you walk into Freddy’s Frozen Custard & Steakburgers, there’s memorabilia all over the walls (explaining who Freddy was and detailing his dreams of bringing custard and burgers to the masses) and a counter, with a menu above, at which you place your order. 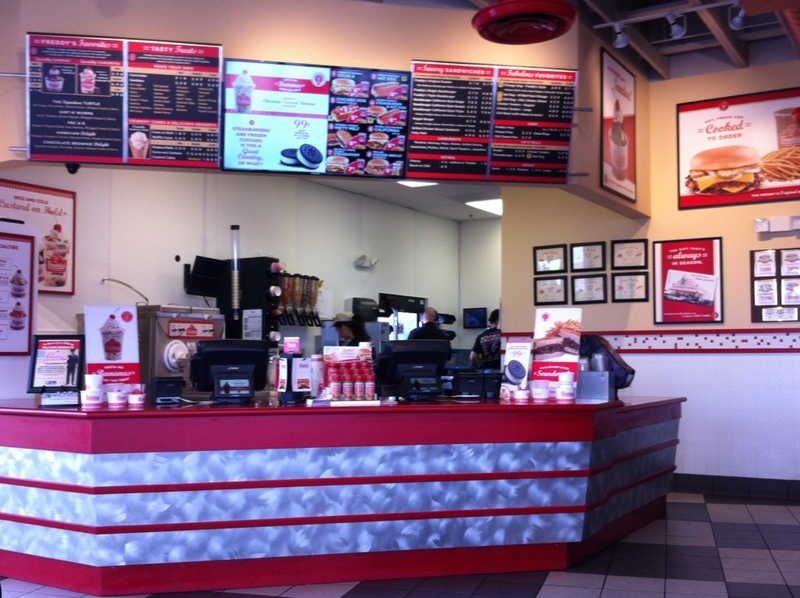 The menu has two distinct sides – custard and burgers. We’ll come back to the custard. The burgers are thin (eighth pound, maybe?) patties, char-grilled. A standard burger is mustard, mayo, pickle (length-wise slices, as opposed to chips) and onion. The server recommended a double, due to the size, and we both ordered a #7 – bacon double steakburger with cheese, combo. They then give you a number, and your soda cup, and you find your seat and wait to hear your number. We waited for the cry of “103” and I headed to the pick-up counter for our tray with two baskets, mine sans pickles, onions and mustard plus ketchup. The french fries are both fantastic and addictive. Like potato sticks from a can, size-wise (remember those? ), yet hot, with a crunchy exterior and a soft center. Jo ordered a concrete (a Blizzard-like custard concoction) with Reese’s Peanut Butter Cups and said that the custard was sweeter than regular ice cream. I’d compare the difference in custard and ice cream is similar to the difference between milk and creamer – it’s thicker and richer.